This is the archive of reviews, most of which were sent out with Newsletters, though a few were reviews posted to the Alt.Music.Cheap-Trick newsgroup so are somewhat less formal. You can tell which is which as the Newsgroup reviews state at the beginning, "A.M.CT Review". Anyway, I hope that you enjoy reading *all* of them ! Please note that my reviews are often both a "travelog" as well as a review of the show(s). They're also pretty long (I talk too much! ), so if you're not interested on the non-CT stuff, please do skip straight to the show reviews! By the way, let me tell you a little about A.M.CT if you've not been there. It's the open, Internet "Newsgroup". Since I started dropping into the newsgroup in early 1996, I've seen it become a cyber-community of its own, with its own characters and style. 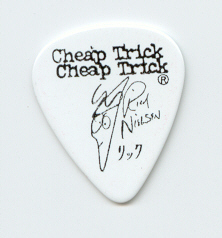 In general it has been a great place to discuss just about anything to do with Cheap Trick, though it has become less frequented as other discussion boards (such as the "official" one on www.cheaptrick.com) came along. With 3 Trickfest's and numerous shows, many of us have had opportunities to meet up and socialise, go to shows together etc. Hence, postings to A.M.CT were often very familiar, with peoples names or net-names being written in reviews. Hence, my A.M.CT reviews were somewhat more informal than those sent out with the Newsletter, because they were written largely to be read by those familiar with the A.M.CT community.